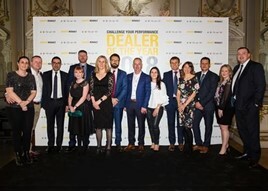 Renault's top performing UK dealers have been awarded at a ceremony in Paris, which saw Renault Retail Group's Cardiff business awarded as the nation's Best Large Dealer. Four high-performing dealers who were awarded commendations at the Renault UK Dealer Conference at the Radisson Blu hotel, near Stanstead Airport, in January, were awarded among the manufacturer's very best from across Europe at a grand awards ceremony at the Stade de France. Representatives attended the event in France with Groupe Renault’s UK managing director, Vincent Tourette, and Louise O'Sullivan, UK network development director. As part of their recognition, the dealer representatives attended an evening dinner to celebrate the Dealer of The Year 2018 Laureates from all of Europe, while in addition visiting the Technocentre, Renault’s global R&D centre. “Each one of our winners has shown an exemplary approach to both customer service and Groupe Renault standards, and thoroughly deserves the pan-European recognition from our parent company,” said O’Sullivan.